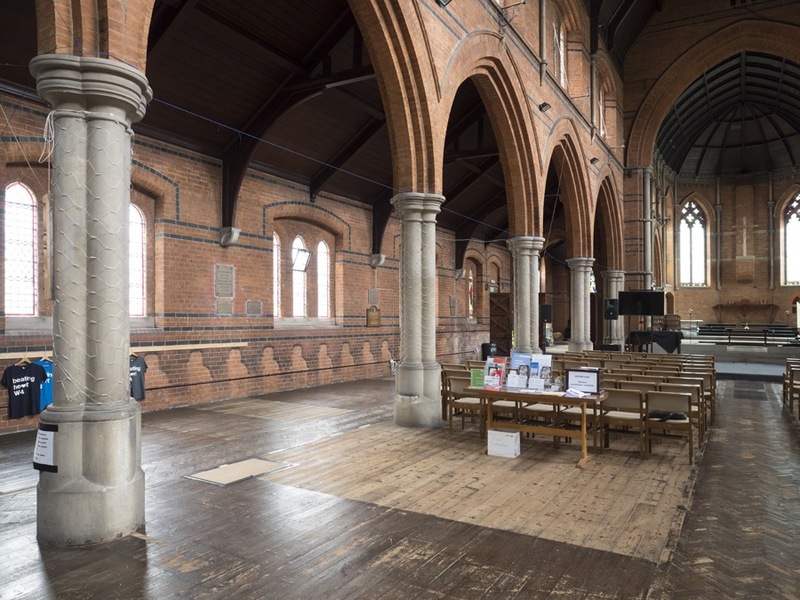 Interior of St. Alban's, Acton Green, London W4, looking east. St Alban's on South Parade, Acton Green, London W4, by Edward Monson Jr. 1887-88. 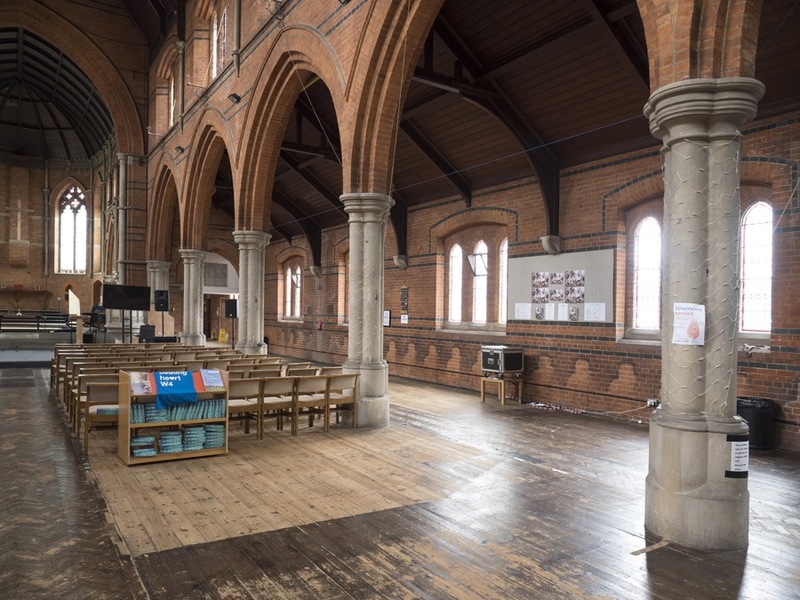 This large church with its north and south aisles and apsed chancel was rededicated last October (2016) by the Bishop of London, Richard Chartres, after the successful battle to save it from redevelopment. 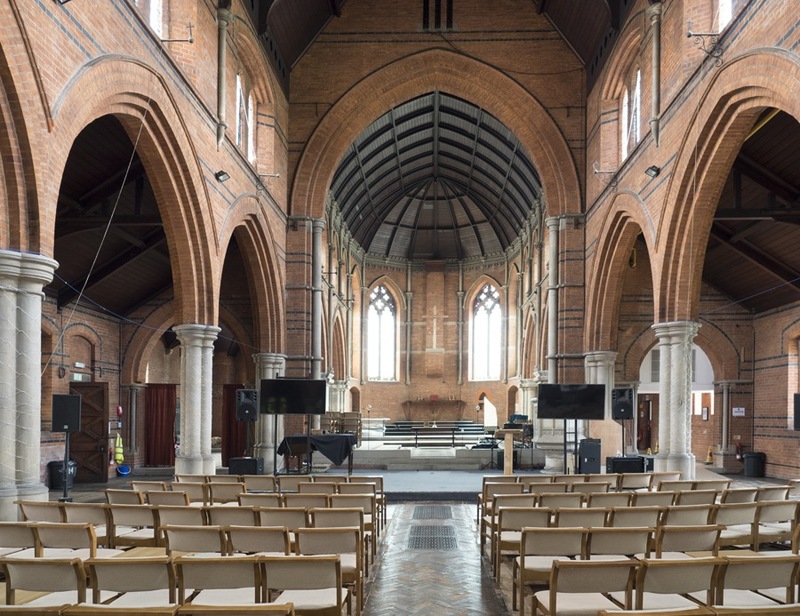 More than 340 people came to the rededication service, described as "the first major event in the building since finishing the first phase of renovation of the church" ("The Bishop of London"). It is heartening to read in the same source that among the various facilities already in place, such as solar panels and a kitchen area, the building on this precious open space has also been equipped with "nesting boxes for swifts." Left to right: (a) Looking into the north aisle. Just visible here, at the top of the north aisle, is a stained glass window by F. Hamilton Jackson (see link below). 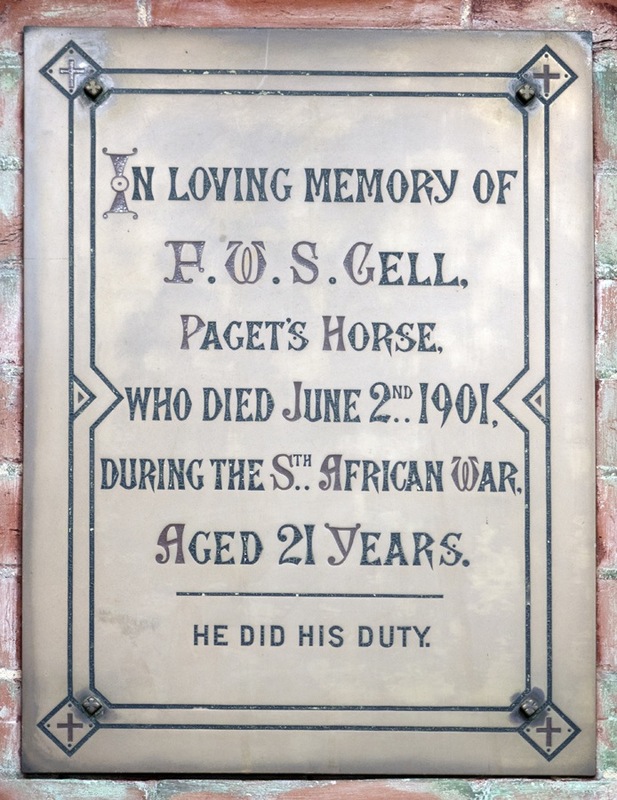 (b) The earliest memorial on the north aisle wall — a decoratively incised brass plaque in memory of F. W. S. Gell, who died on active service in 1901 with a famous unit, Paget's Horse, in the Boer War. There are several World War I memorials as well. 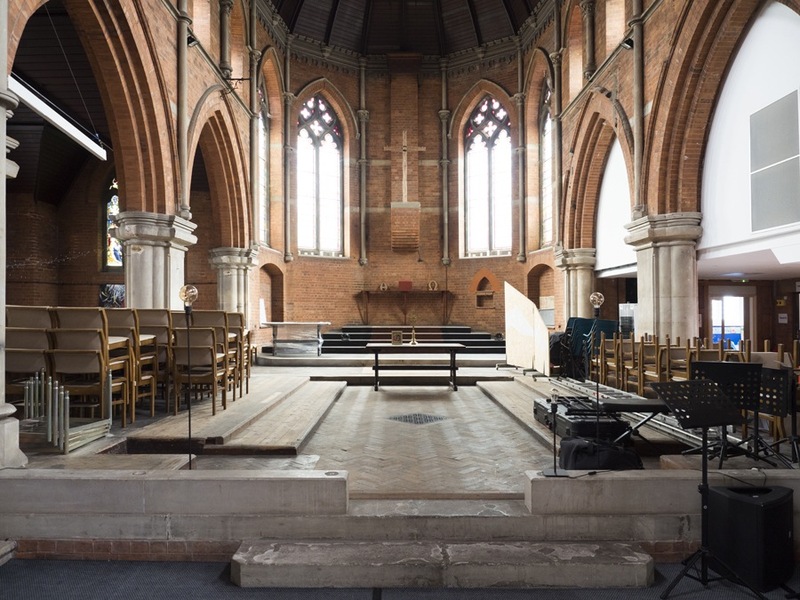 (c) Looking into the south aisle. 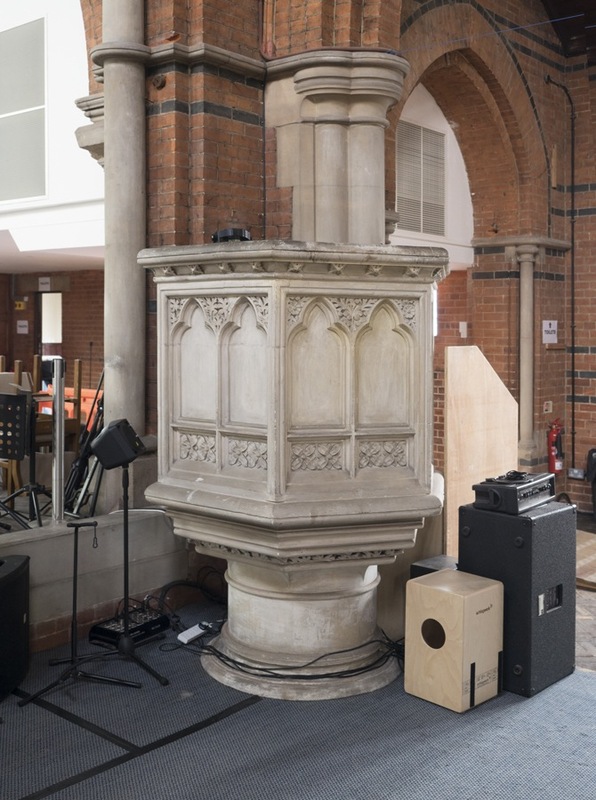 Left to right: (a) The pulpit, fortunately preserved. (b) The chancel. 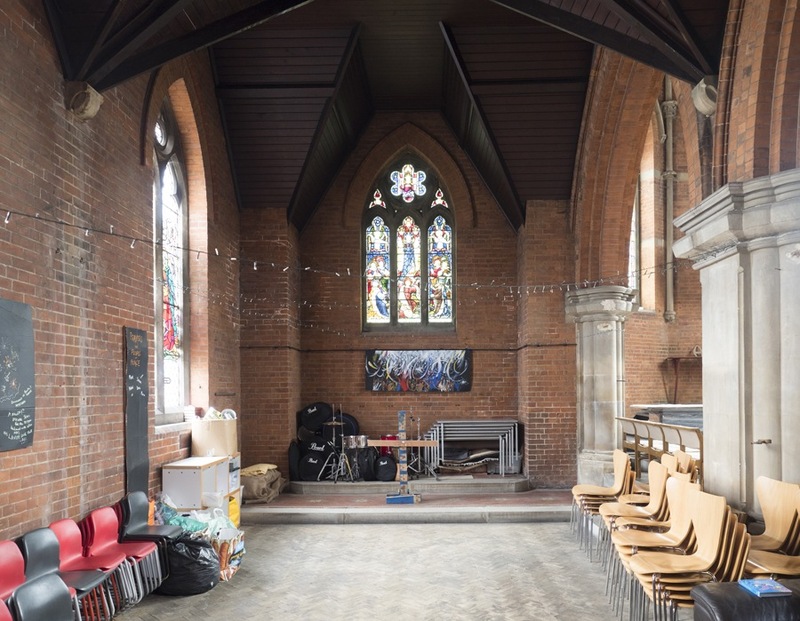 (c) The north chapel, that was added in 1908 (see "Acton: Churches"). The east window in the chapel is by Clayton and Bell, and the other one at the side here is by Morris of Westminster, dating from 1955 (see links below). Left: Looking west from the chancel. Right: The baptistry, though at present lacking a font. Inside is a row of lancets signed by the designer F. Hamilton Jackson (see link below). Photographs by John Salmon, and text by Jacqueline Banerjee. You may use the images without prior permission for any scholarly or educational purpose as long as you (1) credit John Salmon and (2) link your document to this URL in a web document or cite the Victorian Web in a print one. Click on the images to enlarge them. 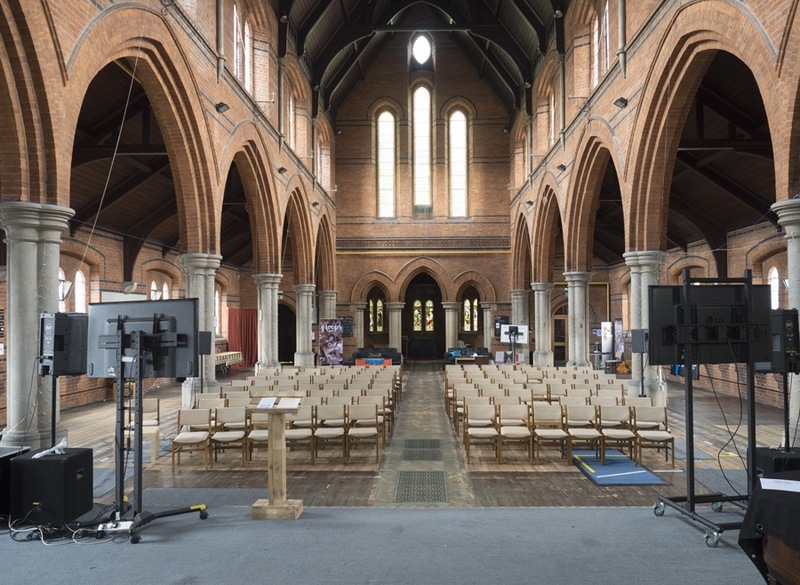 "Acton: Churches." A History of the County of Middlesex: Volume 7, Acton, Chiswick, Ealing and Brentford, West Twyford, Willesden. Ed. T. F. T. Baker and C. R. Elrington (London, 1982): 35-39. British History Online. Web. 27 June 2017. "The Bishop of London Rededicates Renovated St Albans Acton Green Common". Diocese of London. Web. 10 July 2017. Eberhard, Robert. 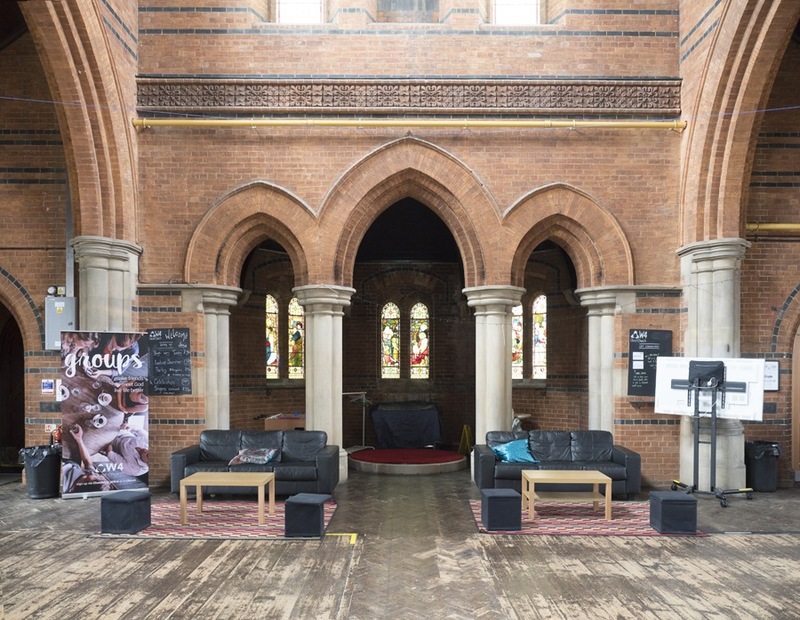 "Stained Glass Windows at St Alban." Church Stained Glass Windows. Web. 7 July 2017.